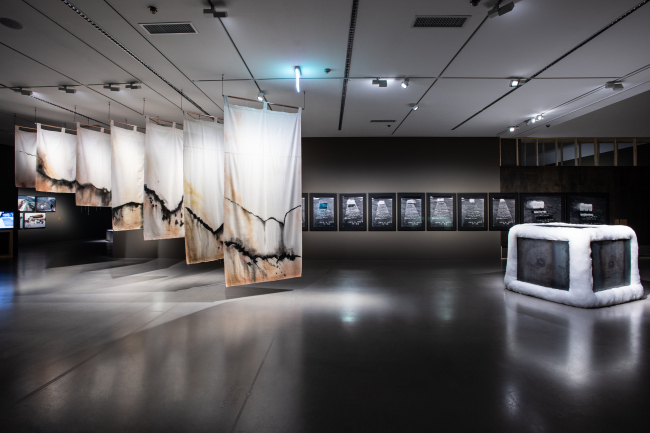 Suspended in an exhibition hall at the National Museum of Modern and Contemporary Art’s Gwacheon branch is artist Tang Da Wu’s work consisting of seven white pieces of cloth tainted with rainwater and soil, made over 10 days of seeping in a gully. The installation by the Singaporean artist, titled “Gully Curtains,” tells a narrative specific to Singapore’s Ang Mo Kio, an area redeveloped in the 1970s. “Awakenings: Art in Society in Asia 1960s-1990s” is the MMCA’s first 2019 exhibition that attempts to create a melting pot of avant-garde artworks and art practices that marked the three-decade period between the 1960s and 1990s. The exhibition mainly addresses how aesthetic radicalism emerged in different Asian countries in the late 20th century, in relation to geopolitical issues that were specific to each nation yet also common in other Asian countries. The issues tackled by the featured artists include decolonization, ideological conflicts rooted in the Cold War, the Vietnam War, rapid modernization and urbanization, as well as democratic movements. “It is perhaps difficult to say that Asian countries developed their own art disciplines without any influences from Western countries. However, the latest exhibition is meaningful in that it attempts to show how Asian countries acquired and developed their own aesthetic voices, in response to their own geopolitical contexts,” curator Bae Myung-ji said during a press conference held Jan. 30 at the MMCA Gwacheon. The exhibition features some 170 works by 100 artists from Asian countries including Korea, Japan, China, Taiwan, Singapore, Malaysia, Indonesia, Philippines, Thailand, India, Myanmar and Cambodia. On display are major artworks by artists such as FX Harsono, S. Priyanto, , Lee Seung-taek, Lee Kang-so, Kim Ku-lim, Yun Suk-nam, Zhang Peili, Toshio Matsumoto and Hiroshi Nakamura. “The selection of artists and artworks for the latest exhibition was a result of a series of research trips to 17 cities in 13 nations in Asia, made by the institutions’ eight curators over some four years,” Bae added. The exhibition comprises four sections with designated themes. Each section features artworks produced in different regions yet in similar contexts or artistic approaches. “We have tried to take transnational approach in curating the exhibition,” curator Bae said. 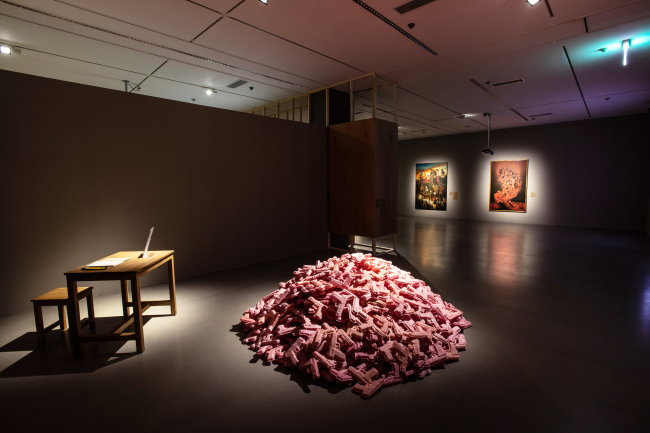 The exhibition is co-organized by the MMCA, the National Museum of Modern Art in Tokyo, National Gallery Singapore and the Japan Foundation Asia Center. “This exhibition is a follow-up project to ‘Cubism in Asia,’” Bae also noted. “Cubism in Asia” was an earlier project by the four institutions that showed some 113 artworks by 76 Asian artist, designed to highlight Cubist influence in Asia. The exhibition runs through May 6 before traveling to the National Gallery Singapore.